The Wilshire Boulevard Temple is known as the synagogue built by Hollywood’s shot callers. The synagogue’s elaborate Byzantine dome was constructed in 1929, thanks to the philanthropy of film moguls, including Warner Bros.’ studio chief Jack Warner. But Senior Rabbi Steven Leder sees a future that uses the congregation’s talents and resources to improve the lives of their Koreatown neighbors. The latest piece in the development of the Glazer campus, located on the temple’s grounds, is the recently-opened Karsh Family Social Service Center, which offers free dental care, vision care, legal aid services, mental health counseling and a food pantry. 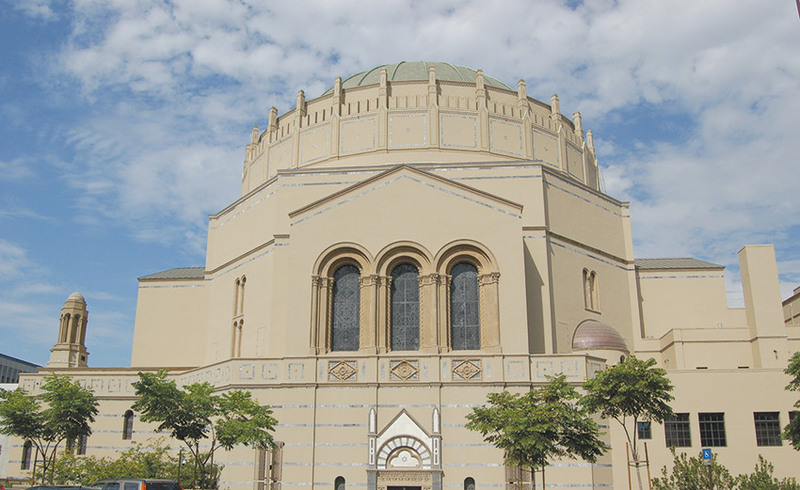 The Wilshire Boulevard Temple staff and community consider themselves a Jewish village, building a community through worship, public service and education, making the temple one of the most respected synagogues in the country. Leder is at the helm of the synagogue’s clergy. He came to the temple in July 1987, primarily to learn from Rabbi Harvey J. Fields. But he was also captivated by the temple’s striking murals and the architecture of the sanctuary. “I knew the congregation that built it was inspiring and aspirational,” he said. Leder is the spiritual leader and confidant of some of the most influential film studio executives and attorneys in Los Angeles. He says that his own oratorical skills have been sharpened over the years by some of these great communicators who are some of the best storytellers in the world. One of his goals has been to foster an environment where every temple member, no matter their position, can be themselves. “It’s a place where they can come together where it’s not adversarial or competitive,” Leder said. But Leder isn’t just interested in making life better for his congregation or Jews in general. He sees making Los Angeles – and the world – a better place as one of the crucial parts of the Jewish faith. The temple’s leadership worked with their neighbors at the KHEIR S. Mark Taper Foundation Community Clinic on Sixth Street to identify which healthcare services weren’t available to the public at affordable costs. That’s how the temple began providing dental and vision care, said Elizabeth Ross, director of the temple’s Karsh Family Social Service Center. “We knew we didn’t have to reinvent the wheel and start new,” Ross said. Some dentists and attorneys in the congregation volunteer their time to meet with the center’s guests. Volunteers also help with support services like greeting guests and checking them in. The Karsh Center will also host other nonprofits including Our House Grief Support Center, the Book Foundation, Bet Tzedek Legal Services, Public Counsel, Alliance for Children’s Rights, Inner City Law, Asian Americans Advancing Justice, Legal Aid Foundation of Los Angeles QueensCare and Hope-Net. The decision to invite the organizations to use the Karsh Center was strategic in making the public feel welcome. 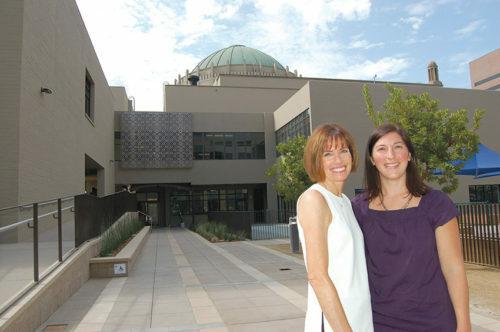 Education is an important aspect of Wilshire Boulevard Temple’s mission, and the temple’s Brawerman Elementary School plays a special role in its community. Brandon Cohen, incoming head of school at Brawerman, sees his job as keeping the school focused on academic excellence and “joyful Judaism” for its 350 students. He encourages his teachers to create lessons that teach students how to collaborate and how distinguish truths from falsehoods. Cohen said he’s been lucky to learn from Nadine Breuer, the founding head of school, who is retiring at the end of the school year. In addition to 40-minutes of Hebrew instruction each day, Brawerman tries to incorporate lessons from the Torah into secular studies by showing how knowledge and past decision making can be helpful when solving today’s dilemmas. “As much as we can, we like to see [The Torah] integrated because we think it’s a much more dynamic way to learn the Judaic studies and secular studies program,” Cohen said.